Religion and Politics in Bahrain: Sectarian Backfire? The Middle East Institute has just published a short essay by me titled, "Sectarian Backfire? 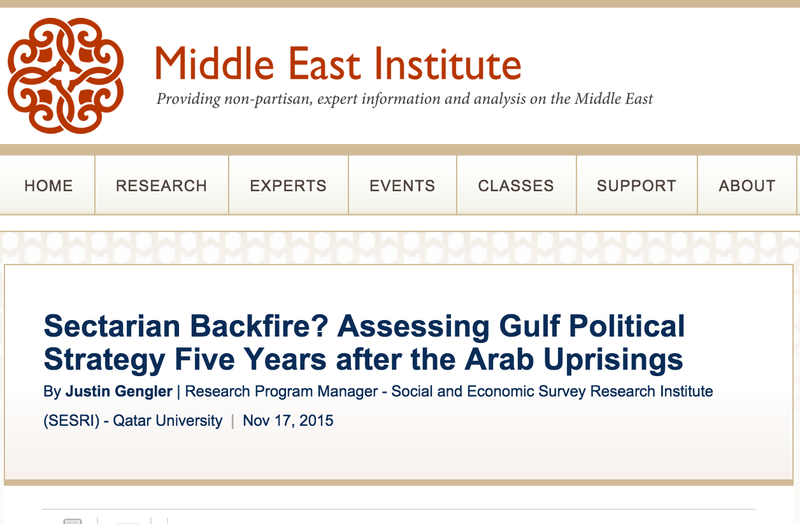 Assessing Gulf Political Strategy Five Years after the Arab Uprisings." The aim, as the title suggests, is to examine the extent to which the deliberate post-2011 sectarianization of Gulf politics by (mainly) Saudi Arabia and Bahrain has been successful from their perspective. In particular, the piece attempts to counter the prevailing sense that the strategy has "backfired" for these governments, what with the rise of Da'ish, deepening of the Syrian civil war and the spread of war to Yemen, and so on. But as I argue in the article, the strategy, insofar as it was implemented in service of the primary goal of regime security, has arguably succeeded beyond rulers' original expectations. Mobilization of co-sectarians doubtless contributed to the immediate goal of fending off domestic oppositions. And, since the rise of the Islamic State, it has also secured GCC governments huge arms deals and essentially a free diplomatic hand to act regionally and domestically in return for their support of the Western anti-IS coalition. Meanwhile, the more onerous physical costs of the sectarian policy have been successfully externalized by Gulf governments. Any change in this sectarian policy, I conclude, is far more likely to owe to the Gulf's changing economic circumstances than to a change in political calculation.